WINNIPEG – After a roller coaster summer where inventory of available listings was up all three months over last year; new listings entered was up 2 out of 3 months, sales were down all three months; and dollar volume was up all three months – September started to show what other markets across the country have been reporting most of the year. The number of listings available for sale in September – our inventory - was up 3.5% over the same month last year (3,396 vs. 3,280). The number of new listings added to the inventory in September was down 3% (1,686 vs. 1742 last year); the number of sales recorded was down 14% (1,040 vs. 1,214); and that drop in sales created a decrease in dollar volume through theMLS® by 10% ($251 million vs. $278 million in September of 2011). 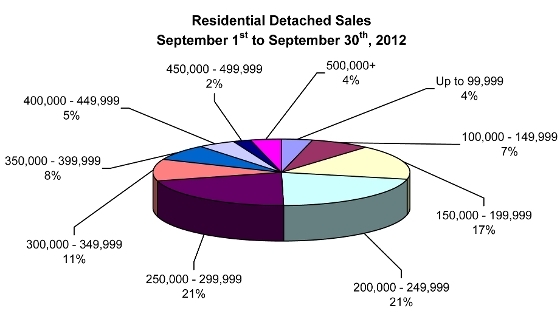 Days-on-market was even off a day for residential detached. This year it took 27 days on average to sell vs. 26 days last September. Condominiums averaged 31 days on the market. But even all these negative numbers for the month couldn’t drop the year-to-date statistics into negative territory. From January 1st to September 30th listings are up 1% (15,840 vs. 15,293); sales are up by just 17 units (10,427 vs. 10, 410); and dollar volume through theMLS® year-to-date is up 5% over last year’s record ($2.55 billion vs. $2.42 billion). “We are watching the market carefully, especially since other markets across the country have been experiencing these kinds of drops in activity for a few months.” said Shirley Przybyl, President of the WinnipegREALTORS® Association. “Other real estate boards are attributing the slow down directly to the Federal Government reducing the amortization period for mortgages from 30 years to 25 years in an attempt to ensure consumers’ debt load is controlled. Other markets have found that this adjustment negatively impacts first time buyers and causes demand to weaken. “We will watch this closely as the year winds down to see if Winnipeg is starting to experience the same trend. “But on the ‘glass is half full’ side of the discussion … with a little more inventory and the potential of reduced demand … maybe buyers will finally get a break from the decade-long sellers’ market and the market itself may realize a little more balance.” She went on to say. Other markets are just releasing their own September statistics and reports are scary in places like Vancouver where they report a decline in residential property sales of 33% for September. But one month does not a market make and the Association will be analyzing the numbers with other organizations to determine if this month is the beginning of a trend or just an aberration.